SGS-I adopts the principles of sector-focused rotary irradiation which divided 18 cobalt-60 radiation sources into two groups (one with 10, the other with 8). These two groups are then arranged on two adjacent sectors in the shape of fans. (see Figure 1.2). By means of collimators’ collimation and directing, the radiation beams gather at the focus accurately and bypass the axes of this focus to proceed rotary irradiation. (see Figure 1.3, 1.4) The treatment Planning System (TPS) simulates the treatment for the targets and the best beams to radiate into the radiation zone can be selected. During the process of treatment, according to the planning of TPS, the stereotactic system will be able to aim at the focus automatically. 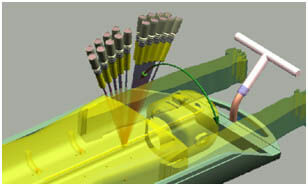 When multiple beams gather to irradiate the focus, the high intensity dose field generated from the focus will be able to render the targets necrosis radioactively. Meanwhile, the around normal tissues will only be averagely irradiated very little. After the treatment, target tissues will necrosis gradually, while the normal tissues will not be injured. Therefore, the aim of non-invasive treatment can be achieved.